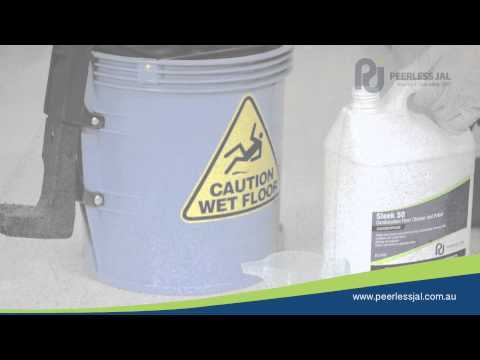 Sleek 50 is formulated from a blend of surfactants and cleaning additives and fully formulated polymer resins designed to efficiently remove dirt whilst depositing a small amount of protective film to the floor surface. Maintenance of floor sealer finishes with Sleek 50 holds appearance and prolongs the need for replacing polish in most areas. Sleek 50 cleans and dries to a pleasing luster, exhibits excellent scuff and black heel mark resistance and is easily buffed to a good gloss level. Sleek 50 is low foaming, and well suited for use either through automatic scrubbing machines or with manual wet cleaning operations.